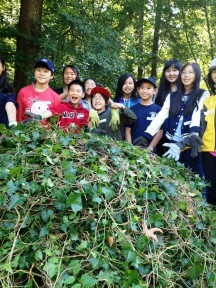 Today, 47 grade 7 students from a Vancouver elementary school put on work gloves and took direct action to remove English ivy, an invasive plant, from Stanley Park. SPES’ School Programs educators hosted the students who pulled ivy as part of the Introduced Invaders program. The program encourages the students to find out first-hand how native species survive under threat from invasive species and human impacts within their ecosystems. The hard work ahead did not deter the children from rolling up their sleeves and having fun: they removed a huge amount of ivy (4 m3) and the longest piece was 10 m long! You can read more about our School Programs here.